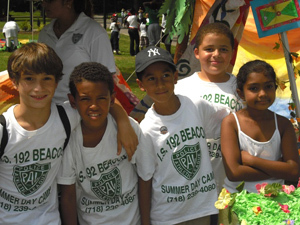 Children from Police Athletic League’s Summer Day Camp program. Thursday, June 25, 2009...The Police Athletic League is holding its 37th Annual Superstar Dinner to honor Stewart Rahr, President & CEO of Kinray Inc. The Lifetime Achievement award will be presented to Robert M. Morgenthau, Manhattan District Attorney and PAL Chairman. The event, held at The Pierre, Fifth Avenue and 61st Street, begins with a cocktail reception at 6:30 p.m. followed by dinner at 7:30 p.m. The Dinner Chair is Daniel Rose and Co-Chairs are John A. Catsimatidis and Donald J. Trump. Proceeds will support PAL year-round youth centers and summer programs serving tens of thousands of children annually. Benefit tables range from $100,000 to $12,500. Individual benefit tickets are $1,250. For more information, please call (212) 477-9450 ext. 310.